The autumn feasts in the third time among God’s seven feasts in three times began with the Sacred Assembly of the Feast of Trumpets on September 10 (the first day of the seventh month by the sacred calendar). Ten days later, on the 19th (the tenth day of the seventh month by the sacred calendar), the Sacred Assembly of the Day of Atonement was held. 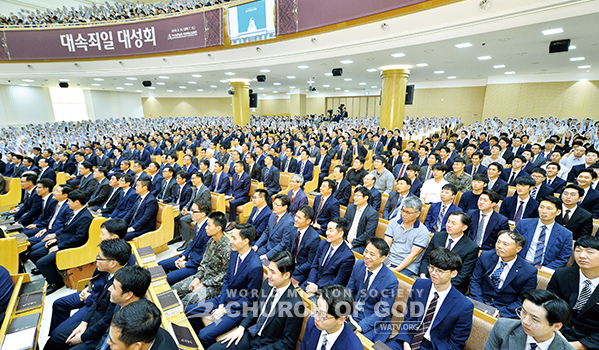 This year, which marks the hundredth anniversary of the birth of Christ Ahnsahnghong who restored the new covenant which was ruined after the Apostolic Age, the members of the Church of God in 175 countries participated in the services all together, ruminating on the meaning of the feasts and the grace of God. The holy autumn feasts began with Mother’s earnest prayer. 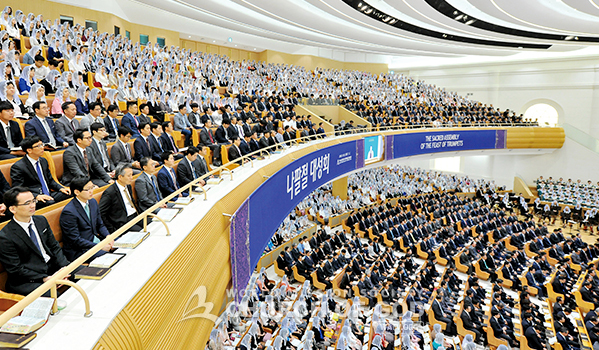 At the Sacred Assembly of the Feast of Trumpets held at the New Jerusalem Pangyo Temple, Mother prayed that all Her children would repent sincerely so that they would be cleansed of all their sins they had committed in heaven and on the earth and be born again to be worthy of the kingdom of heaven, and would also lead many souls away from sins by loudly blowing the gospel trumpets that urge for repentance of all seven billion people. 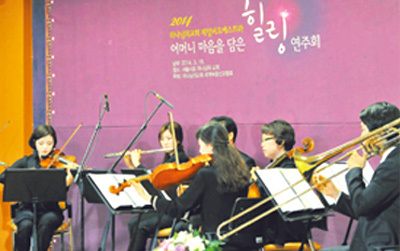 “We’ve been blessed more than anybody else because we’ve received the forgiveness of sins and salvation in the age of the Holy Spirit when God has restored the feasts and Zion,” said General Pastor Kim Joo-cheol. He encouraged us to offer our true thanks and praise to God by keeping the feasts holy. He also explained the meaning and importance of repentance through the parable of the prodigal son among Jesus’ teachings. In the parable, the son receives his share of the estate from his father, sets off for a distant country, and there squanders his wealth in wild living. However, after he spends everything, there is a severe famine and he begins to be in need. The son finally regrets what he has done and returns home, thinking that it will be better to become his father’s servant. However, his father hugs him and rejoices, saying, “This son of mine was dead and is alive again; he was lost and is found.” “We were slaves to sin before we repented. However, after we repented, we must live a holy life that leads to eternal life as servants of righteousness. Just like Prophet Jonah who turned away from his sin of disobedience and led 120,000 Ninevites to repentance, those who repent fully can achieve a great work even in one day. Let us not just be satisfied with our repentance, but lead all mankind to the forgiveness of sins,” said Pastor Kim Joo-cheol. (Lk 15:11–24; Jnh 2–3; Ro 6:16–22; Ac 3:17–19). After the Exodus, the Israelites committed a sin of making a golden calf and worshiping it in the desert. Due to this incident, the tablets of the Ten Commandments that Moses received 40 days after he went up Mount Sinai were broken into pieces, and 3,000 idolaters lost their lives. When the people took off their ornaments and repented with all their heart, God called Moses back up to Mount Sinai and granted him the Ten Commandments a second time. The day when Moses descended with the second tablets of the Ten Commandments is the Day of Atonement, the tenth day of the seventh month by the sacred calendar; and the first day of the seventh month, ten days before the Day of Atonement, is the Feast of Trumpets when the Israelites were urged to repent with a trumpet blast. The church members, who confessed their sins to God every morning and evening for ten days, came with godly hearts to the Sacred Assembly of the Day of Atonement, when God forgives all sins. Mother gave thanks to Father for granting the grace of atonement by establishing the feasts to save the children who sinned in heaven, and She prayed that Father would take delight in the smoke of the incense of the prayers the children around the world offered up for ten days and forgive even the sins as small as dust. “We have received the blessing of the forgiveness of sins from God without cost, so let us live holy lives like God who is good and holy, and share the greatest love and happiness with the world by leading others to repentance and salvation,” Mother asked again. “Our sins were not forgiven without cost. They were atoned for, as God was pierced, crushed, afflicted, and crucified. 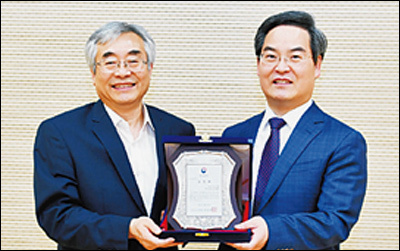 Let us know the love of God, who was sacrificed endlessly until we were freed from the slavery of sin, and let us not sin anymore,” said General Pastor Kim Joo-cheol. He empha-sized again that “the proof of true repentance” is “to preach” to lead not only ourselves but even other people to repentance, and asked us to “refine our harsh character, be born again as new creatures, and bear fruits in keeping with repentance” (Lev 16:5–22; Jer 17:12–13; Jn 1:29; Isa 53:1–12; Eph 1:7; Mt 28:18–20). The church members gave sincere thanks to God for giving them the blessing of the forgiveness of sins through hardship and sacrifice, and prepared to keep the Feast of Tabernacles which has the promise of the Holy Spirit of the latter rain, engraving upon their consecrated hearts the will of God who hopes for the salvation of mankind. The high priest entered the Most Holy Place only once a year, on the Day of Atonement, to make atonement for the sins of the people and for their sins. On this day, the high priest made atonement by sprinkling the blood of a goat and a calf, the sin offerings, throughout the sanctuary, including the Most Holy Place. He also put all the wickedness and sins of the people on the head of the goat chosen by lot as the scapegoat, and sent it to a solitary place in the desert. The sins that the people committed stayed in the sanctuary through the sacrifice of animals, but on the Day of Atonement the sins were put on the scapegoat, and as it wandered about in the desert and died, the sins came to an end. This signifies that Christ who is represented as the sanctuary takes over our sins, but our sins will come to a complete end as Christ passes them to Satan, the chief instigator of sin, according to the principle of the Day of Atonement.